1) Department of General and Operative Surgery, 2) Department of Nuclear Medicine, Metabolic Therapy and Radiotherapy, 3) Department of Surgical Diseases University Hospital “St. Marina” Varna, Bulgaria, Medical University of Varna, Bulgaria. .
Adrenal oncocytomas are usually non functional and hence incidentally detected. Most of these adrenal neoplasms are benign. Functioning adrenocortical oncocytomas are extremely rare and most reported patients are between 40 and 60 years of age. We found in the literature that only several cases of functioning adrenocortical oncocytomas have been reported in childhood. We report a case of functioning adrenocortical oncocytoma in a 9 years old female child presenting with virilization. She presented with deepening of the voice and excessive hair growth, and elevation of plasma testosterone and dehydroepiandrosterone sulfate.We presented adiscussion of this case,successfully managed by laparoscopic surgery. Kolev NY, Ignatov VL, Tonev AY, Zlatarov AK, Encheva EP, Kirilova TN, Bojkov VM, Ivanov KD. ADRENAL ONCOCYTOMA IN CHILDREN – case report. J of IMAB. 2013 Jul-Dec;19(3):470-472. 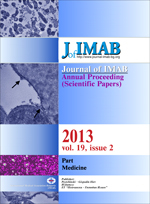 DOI: 10.5272/jimab.2013193.470. 2. Hamperl H. Onkocytes and the so called hurthle cell tumor. Arch Pathol. 1950; 49:563-70. 6. Gumy-Pause F, Bongiovanni M, Wildhaber B, Jenkins JJ, Chardot C, Ozsahin H. Adrenocortical oncocytoma in child. Pediatr Blood Cancer. 2008 Mar;50(3):718-21. [PubMed] [CrossRef] .